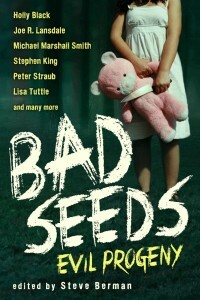 Back in January, we mentioned that Robert McCammon’s short story “Yellowjacket Summer” was going to be reprinted in an anthology entitled Bad Seeds: Evil Progeny. The Prime Books trade paperback will be available in July and is pre-orderable from Amazon now. The cover for the book can be seen to the right; it has been added to the Book Cover Gallery. 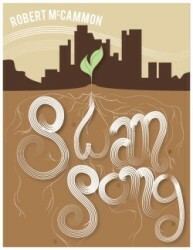 Artist Lia MacLeod posted her design for a book cover and title page for Swan Song on Behance. She graciously allowed me to add it to the Fan Artwork page here. You can click on the image below or click here to see her work. And for those of you on Google+, we’ve created a Robert McCammon Community. Updates to this site will be posted there and on the Facebook page. Please feel free to join the Community! Robert McCammon’s Swan Song is one of today’s Kindle Daily Deals! Today only, you can buy the Kindle ebook for only $1.99. 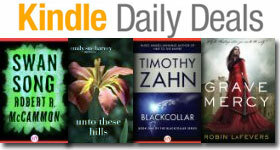 Click here to see the Kindle Daily Deals. Southern gothicist and paranormal historian McCammon (Gone South; The Wolf’s Hour) combines the two genres in this fun, fast novella. 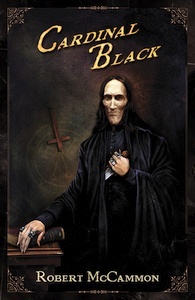 You can pre-order the signed limited edition or the trade hardcover from Subterranean Press here (you can also read an excerpt there). The trade hardcover can also be ordered from Amazon US here. Blog tour continues with a Horror World interview, plus more audio news and reviews! Audiobook, Baal, Interviews, Mystery Walk, Reviews, Swan Song, The Providence Rider Comments Off on Blog tour continues with a Horror World interview, plus more audio news and reviews! Robert McCammon’s Virtual Blog Tour to support The Providence Rider continues at Horror World today. They’ve posted a new interview with Robert McCammon conducted by Blu Gilliand. Hot on the heels of the news that GraphicAudio will be releasing dramatizations of the Michael Gallatin books, Brilliance Audio will be releasing the Audible production of Swan Song, read by Tom Stechschulte, on Audio CD and MP3 CD on December 11, 2012. Both products are currently listed on both the Amazon and Barnes & Noble websites. You can pre-order them via the links below. The success of the Audible edition of Swan Song is what led to the decision to release the book on CD. 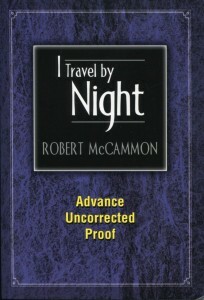 There are a couple of new international editions of Robert McCammon’s work coming out. 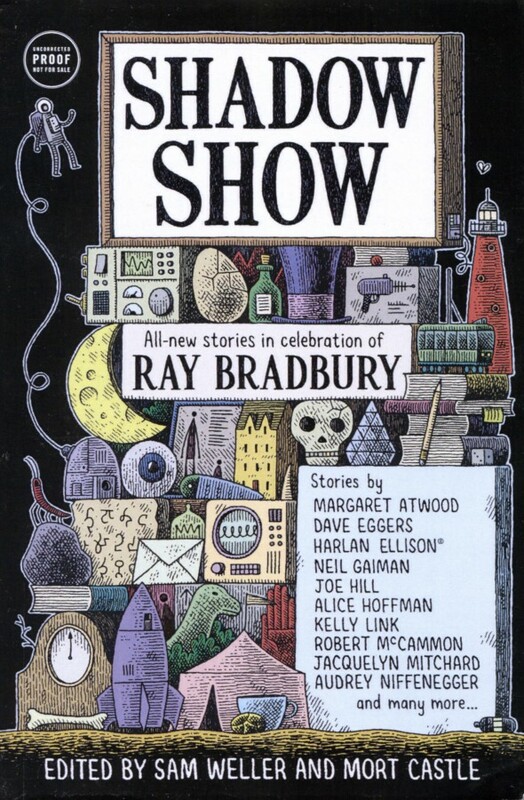 A few vintage editions have also been added to the Book Cover Gallery, along with the cover of the ARC for the upcoming Bradbury tribute Shadow Show; it’ll be out in July 2012. Click on an image below for a larger version of the image. 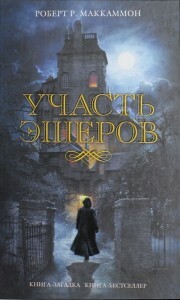 Russian publisher Eksmo has released a new hardcover edition of Usher’s Passing. 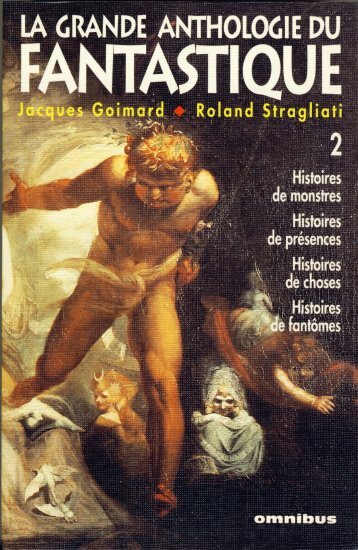 A 1997 French book, La Grande Anthologie du Fantastique (Tome 2), included McCammon’s “Yellowjacket Summer”. 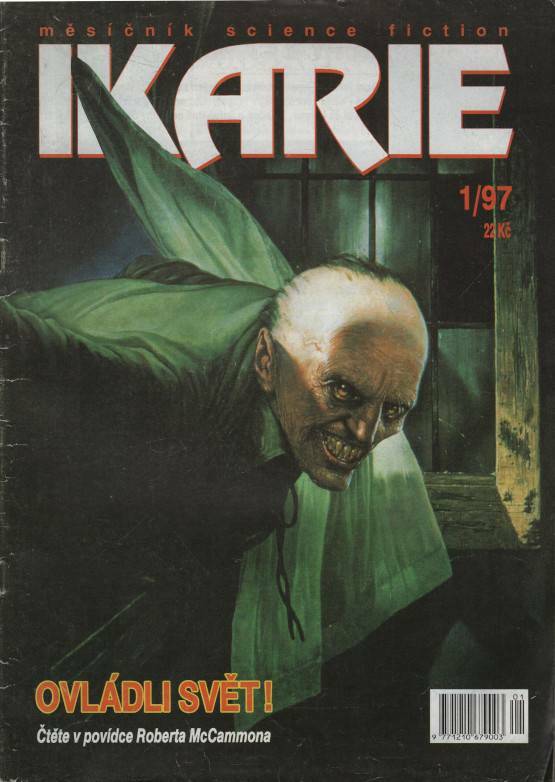 A 1996 Czech anthology, Hlas Kvre (Voices of Blood), included McCammon’s “Nightcrawlers”. 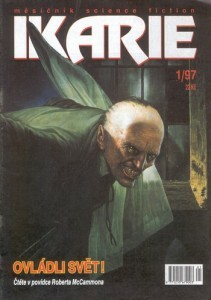 A 1997 Czech magazine, Ikarie, included McCammon’s “The Miracle Mile”. 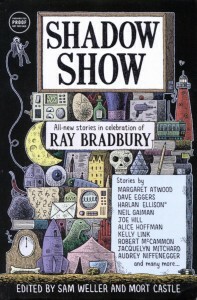 The HarperCollins trade edition of Shadow Show includes McCammon’s new story, “Children of the Bedtime Machine”. Blogger Midnyte Reader posted the funny “The night I got to ride in a car with Robert McCammon & Sherrilynn Kenyon (or, best night EVER)!” She includes photos of the evening. The Robert McCammon Goodreads group is off to a great start, with over 150 members now. They plan to do a monthly read and discussion of a McCammon novel. 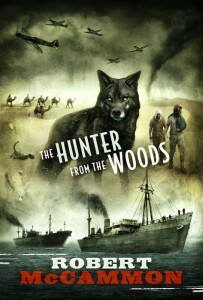 Subterranean Press has announced the trade hardcover edition of The Hunter from the Woods, which will be available in Fall 2012. You can pre-order the trade hardcover edition from Subterranean here. Subterranean Press has also published the final part of their 3-part interview with Robert McCammon by Gwenda Bond. She and Robert talk about Matthew, his favorite research finds, the challenges of writing historical fiction, and the exclusive new Matthew Corbett novella that will be included with the limited edition. Robert also shares a tip about something to look for the books that fans of the series won’t want to miss. You can read part all three parts of the interview on the Subterranean site: Part 1, Part 2, Part 3. Finally, Lou Pendergrast has created a Robert McCammon group on GoodReads. The goal is to read one Robert McCammon novel each month and discuss it. 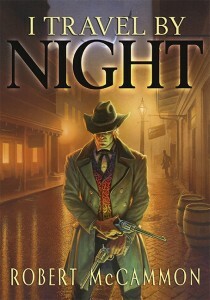 Lou Pendergrast of the website More 2 Read has posted a brand-new interview with Robert McCammon. You can read it here. Horror World has posted a fantastic review of The Providence Rider. Author Glenn Starkey recently wrote a blog article entitled MIA Part 2: Robert McCammon, Author of The Wolf’s Hour. Opinionator also posted a review of The Providence Rider. You can read it on their site here. Author Carl Alves posted a review of The Wolf’s Hour. YouTube user CombatOasis posted a video review of Swan Song. Blog Crash and Byrne posted a review of Blue World. 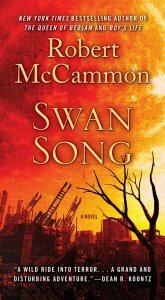 Jennifer at Book Den continues The Great McCammon Read with her thoughts about Swan Song. The Five is the assured, confident work of a man who has climbed back to the top of his game. It’s tight and suspenseful, and yet manages to take long sidetrips into the histories of the characters that don’t detract from the action, but instead enhance it. This is the kind of book you get lost in; the type of story that you’ll find yourself reflecting on long after you finished it, wondering what those characters are up to now. Do yourself a favor and pick it up today. 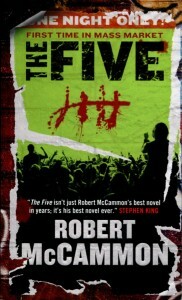 This current novel, The Five, is not only about a band; it’s about music. That swelling ache you get in the marrow of your bones when you hear your favorite guitar maestro let his fingers fly over the frets and strings. The pounding your heart begins to do when you hear that bass line beat it’s way through the speakers or the drum beat begins to thump. 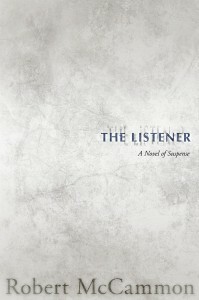 This novel is brilliantly alive with that love and passion for music.